Remember way back when, I said I wanted to make a cake each year on our wedding anniversary... like a birthday cake for our marriage? I dropped the ball last year for anniversary three. Forgive me, we were out of the country, on the beach. But this year, sandwiched between Switzerland and Italy and visits from family so we could share the news about Baby P, I MADE AN ANNIVERSARY CAKE. I was really dang proud of myself. And yet... I didn’t blog about it. Not because it wasn’t good! You know Joy the Baker’s salted caramel cheesecake is gonna be good, y’all. No, I was just way too caught up in everything else to even stop and take a photo along the way. As it turned out, though, Mr. P and I both thought the crust wasn’t quite... June enough. Joy used gingersnap cookies for the crust, but in June, a basic graham just seems more appropriate. 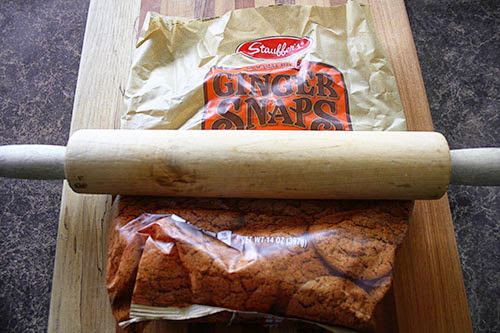 But here we are in the fall, when gingersnaps are totally tasty and you might be looking for a dessert to take to a Thanksgiving gathering this week. In case my pumpkin cheesecake isn’t right for you (perhaps someone else is bringing pumpkin pie? ), I thought I’d tackle Joy’s cheesecake all over again! 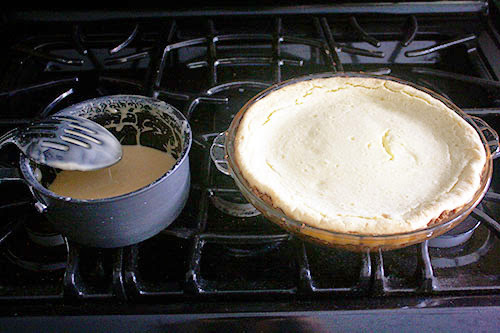 Oh, I note that last time, I used my springform pan and basically increased both the crust and cheesecake filling by 50% in order to fill it up. It worked just fine, so if you’re in the mood to springform this thing for a larger crowd, go for it! This time, though, I decided to stick to Joy’s recipe, partly so we could save on calories, but also because I didn’t want to buy extra ingredients. Yup. Here we go! We start with crunching up the cookies to make the crust. I went for the old-fashioned method of crunching them up in a bag. Yes, I own a food processor. But... I just really hate loud noises... a whole whole lot. Whatever, I needed the exercise. Hopefully you’ll end up with two cups of crumbs (if you have less, add more cookies; if you have more, it’ll be delicious!). Add that to half a stick of melted butter (I used salted; it was fine) and two tablespoons brown sugar. If you’re as lazy and hate washing dishes as much as me, you can do this directly in the pie plate. Mix it up, press it into place, and pop it in a 350-degree oven for 10-15 minutes! As soon as it’s done, turn the oven down to 325 for the cheesecake. Ok, time for the filling. 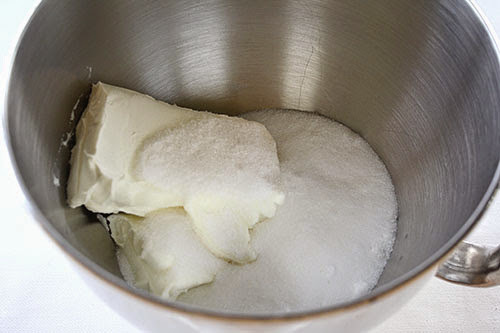 First, beat together two blocks of softened cream cheese (16 ounces total), 1 1/3 cup white sugar, and a half-teaspoon of salt. 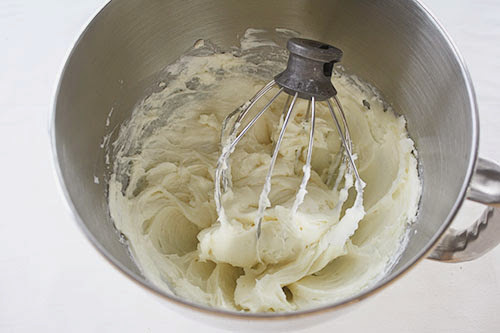 Once creamed together, add two teaspoons of vanilla (or... just pour some in, like I do) and two eggs, one at a time. Apparently the eggs are supposed to be room temperature. Mine were not, as remembering to set out the cream cheese in advance was as much as I was capable of doing. 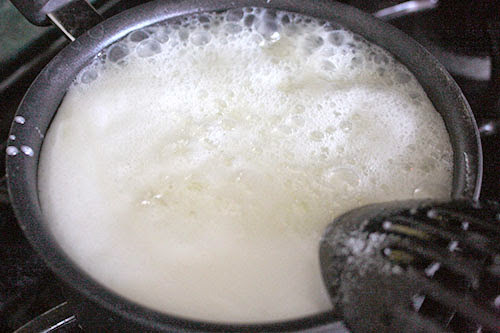 And finally, add a cup and two tablespoons of cream. I added whipping cream instead of heavy cream because, I swear to all that is good and holy, my store does not carry proper whipping cream. It’ll work anyway, promise! And pop that in the oven (which should be 325 degrees by now!). I should mentioned, Joy goes through the process of the water pan at the bottom. I did it last time, and it turned out great... and then I accidentally left the pan in the bottom and didn’t use my oven for two months (hello, summertime) and then discovered a rusted-out, ruined cake pan in the bottom sometime in August. Blah. So I skipped it this time, in the interest of SCIENCE and also not ruining my single remaining cake pan. The result, if you fast forward to the bottom: a few small cracks, vs. no cracks with the water pan. Your call! Anyway! Bake for 50-60 minutes until it’s all puffy and pretty. Mine took a solid hour and looked rather insane and puffy when I took it out. No worries! 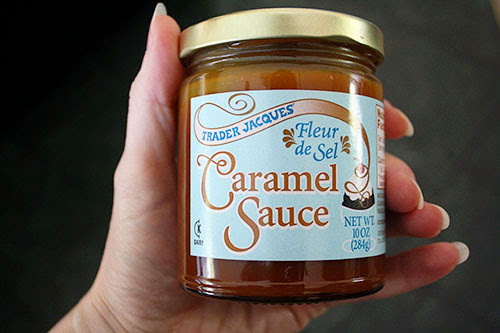 While the cheesecake bakes, it’s caramel time! Here’s where I could present an excellent tutorial on how NOT to make caramel sauce, with photos and all. 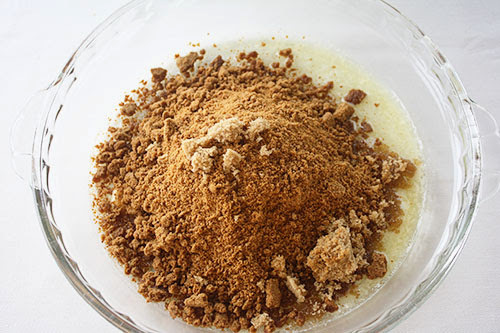 It involves adding the cream WAY TOO SOON OMG, so that you basically make a toffee crust. I screwed it up last time, too, because I am inexplicably terrible at caramel sauce. Know thyself. To be clear, both times I messed it up, it was from not reading properly, and thus was entirely my fault and not Joy’s. Follow her directions and you should be fine. But... this stuff I used for the caramel apple cookie cups works too, if you aren’t brave enough to screw caramel topping up twice, like me. Then just pour the caramel over the top and add a generous sprinkling of sea salt! 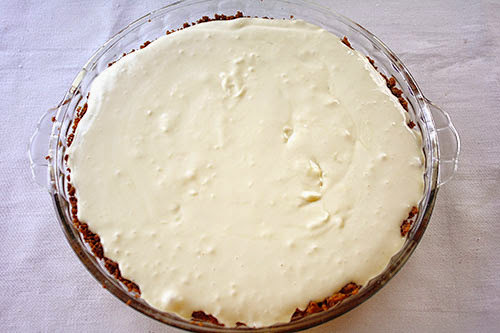 You guys, this is hands-down my favorite cheesecake recipe, no matter what you put on the top. I’ve made others, but this one has perfect amount of sweetness, the best texture, not too many cracks even if you skip the pan of water at the bottom. 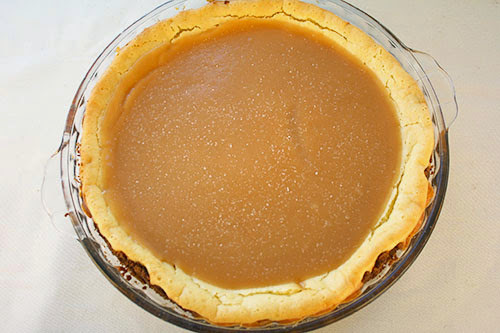 I’ve only ever made it with the gingersnap crust and the caramel topping, but I could see making this filling with a graham or an Oreo (ooh!) crust, and using it as a base for any toppings – fruit, or chocolate – or even plain. It’s fab. So perhaps this will have a spot at your Thanksgiving dessert table, or something you can include in your holiday baking wish list. I know I want to make it again absolutely as soon as possible... maybe with that springform pan, so there’s even more to love. Mmmm. Enjoy! I was watching the great british bake off on TV the other night, and they used a mister to spritz some moisture in to the oven before baking, maybe that would work instead of the water pan? One guy chucked a cup of water in the bottom of the oven which succeeded in tripping it out and some used ice cubes which seems brave to me, but I'd give the water spray a go. Can you use "light" cream cheese or would the consistency not turn out as well as if you'd used "regular" cream cheese? Just curious. @Anon, you know, I always thought the pan of water was to keep the temperature more constant (like how water holds temp better than air)... but I'm now realizing I may have totally made that up in my head. Huh! Yes, maybe the spray bottle would work! @Janice, I've subbed it into other recipes with little consequence - it might be slightly less rich and creamy, but sometimes that's worth the calorie tradeoff!